Me: “Sorry didn’t know you were still reading it. I put it back on the bookshelf.” After all it had been sitting on the end table for days :). Oh yes it is :). I have finally come to that place in our new journey where confidence has overcome fear (oh yeah ). I always try to be as honest as I can about our educational journey here and if I were to say I wasn’t a least bit nervous about jumping into unschooling I would be lying. Actually there have been times when I didn’t think I could do it. At first it seemed Miss Sky would shoot down every idea I mentioned. She didn’t seem interested in reading anymore and television and video games filled her days. Yes self-doubt began to rear its ugly head. I had to keep repeating the decision I made ,at the beginning, that we are working on our relationship over and over. If any learning happened during this time it would be a bonus. Then one day all of a sudden it came full circle. It seemed like any other normal day yet it was like I was looking through a new pair of glasses or something. I began seeing learning in everything(television and video games included). It’s a lot harder to capture everything the girls are learning about these days and sometimes it feels artificial to try to capture the moment with a photo but I will try my best to continue recording our learning adventures. I mentioned before how Miss Sky hasn’t seemed too interested lately in reading when all of a sudden she began to pull books off the self to do a little reading before bed. This is HUGE for me because I was SO nervous she would never want to read books on her own without any persuading again. Well it started with The New Way Things Work by David Macaulay. This led to other science books ,I happened to pick up at Goodwill, being dragged to her room. Then one day while helping Little Sis with Animal Jam, Miss Sky comes up and asks if I could drill a hole in a cork for her(Well okay). 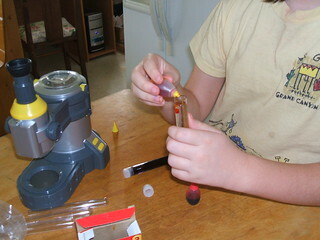 She was making a sand clock using parts from our recycling. 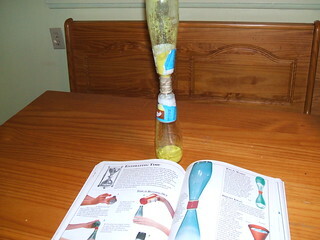 (Yes those are wine cooler bottles :o). What amazed me most though was that she did this completely on her own without me even knowing (and coming up with using a cork was all her idea). 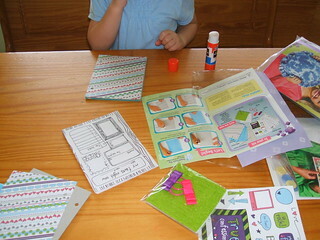 Then the girls received some craft kits in the mail from family members. One being a journal that needed to be made right away. The girls spent most of the day not only filling in their brand new journals but Miss Sky started writing her story of Animal Girl(who has since been given the name of Libra). Again completely all on her own. Of course this is just a small dent into what has been going on around here. We had lots of the same game playing and Avenger episode watching but I had to post this just in case there was anyone, like myself, that thought their child would never “want” to read a book, let alone a “Science” book, or write again after starting on their journey into unschooling. If Miss Sky did, your child will too. Wishing everyone a great Labor Day weekend! She came back with the tub of dried blueberries instead. Is it possible to still have “rhythm” and unschool ? Yes, it just might look a little different from before. Actually to be honest our rhythm has not really changed much. Our family has always kept a different schedule then most due to Papa’s work hours. So for us our families rhythm has never been what you would call normal :), we just found what works best for us. Unschooling works the same way we just changed a few things around. For instance we still have the same sleeping hours, wash days, meal times, bath days on so forth. We always have even before Waldorf education. Each day the girls help me come up with the items using our food pyramid as a guideline. Miss Sky really enjoys making sure something from every food group is represented and it has been fun coming up with all the different ideas too. This is not “enforced” by the way it was actually Miss Sky’s idea to use the food pyramid in the first place. So why has this worked so great for us ? Well sometimes each of us is busy doing our own thing like reorganizing a playroom, playing a video game or playing on the computer and this way everyone can eat at their own convenience. Papa wakes up first in our household so he has become the breakfast person(which he makes best anyway :)). So that just leaves me with dinner. I have previous posts on how we do dinner by taking a binder and separating it by season. Being that it is summer most of our dinner recipes revolve around the grill and stove top(lots of stir-fries, tacos ,fajitas and salads). I have 2 weeks worth of recipes for each season and just rotate. So this is how our meals work. After breakfast is when we do “circle time”. This is when everybody,parents included, gets to voice their opinion on the days activities. Being we are a 1 car family we need to plan “outings” in advance. So if someone wants to go to the library, or another outing it needs to be mentioned during this time. Items that always seem to be mentioned daily ,that involve the need of others, like board games and reading aloud have found a place in our daily rhythm. Board games like to be played with all members of the family so we play those first right after breakfast to include Papa. Then we usually read together so that I can get started on what ever daily chores like dishes or laundry that need to be done. So after reading the girls usually fall into doing whatever it was they wanted to do from the list. For example Little Sis is really into Animal Jam right now and Miss Sky is really into playing video games so one gets the computer first and the other gets the television. Then they switch to take turns. Meanwhile Mama is “always” an ear shot away for any questions or help that may be needed. The only time this changes is when someone mentions they want to watch a program or movie on the Ruku or if there is an outing planed. Then if a person doesn’t want to watch the program (like Miss Sky has outgrown Dora and Little Sis really doesn’t like animal documentaries) that person gets their computer time. Again I am usually watching the programs with my girls and am available for help if needed. So what about “me time” ? I have learned to be flexible :). Being a parent our children’s needs have always come first so this is nothing new. Some days are busier then others, sometimes I don’t always get to have computer time when I want it but sometimes my girls don’t either. Sometimes I need to pay a bill or send an e-mail. Sometimes my girls play video games together (like right now). The thing is though since I respect their wishes and they “know ” they will get to do what they want when I am done, they respect mine. Also voicing my wants during circle time has really helped. I have really been getting in with the series The Tudors lately,thanks to the Middle Ages time period we have been reading about. This is a program I do not recommend for children so I usually am more than happy to wait until after the girls are in bed to watch. I also am reading books about Bloody Mary and Queen Elizabeth which can happen during the day when my girls are using the TV or computer. I think remembering to always put our families relationship first is what has helped us most with our new transition. Also I just wanted to add one more thing, what makes everything I just listed above unschooling (for us) is the fact that at any time my girls have the right to say no. Sometimes reading aloud may not be an option and that is okay :). One of the reasons I decided to start “schooling” year round was so we could take off whenever we needed to. Of course, since then I discovered when unschooling there IS never a day off, just some days are busier than others. Well, this has been one of those not too busy weeks. I decided to reorganize our playroom yet once again. I can not express enough all of the “radical” changes that have been taking place around here(and I am not just talking about lifting bans). If there is one thing I can spare anyone who finds my blog through old Waldorf links or is just newly discovering Waldorf it is Please, Please really think about the things you will be purging to make space for all the “new” stuff(Oh and you really don’t need a “Waldorf” doll and play stands but that is a whole other can of worms :)). Anyway, I learned this the hard way. I got rid of all our plastic storage bins and replaced them with baskets. Well, I realize now just how valuable having see-through containers can be, not to mention how much easier they stack on one another ( most are made in the USA from recycled plastic and some can even be recycled again error). As far as learning goes though at first glance it seemed like there wasn’t much of it going on. There has been lots of this. Which of course led me to print a bunch of blank comic strip pages, binding them like our MLBs, to be ready for when inspiration strikes. 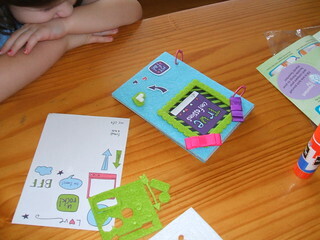 The girls also found several new favorite games (board and not). 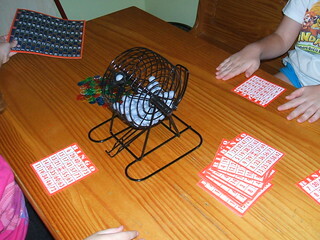 The girls have fallen in love with Bingo ( I am trying to find a “fun” place to take the girls). We even set up prizes to win like candy bars or extra allowance(Papa and Mama receive “get out of chore coupons” :)). Blackout so far is their favorite. Miss Sky also found 2 more video games Thrillville and Samurai Warriors. Keeping with the Interactive History books I mentioned previously, Miss Sky really has taken a great interest in the different types of soldiers and their weapons of choice. She is amazed at their differences as well as their similarities. 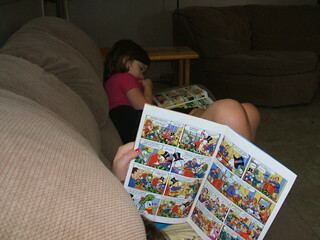 The series is a big hit with Little Sis as well. She gets SO tickled when one of her choices ends in death. I am just happy they are happy. After all, that was my whole point. One of the first things I learned about unschooling was that it is NOT an excuse for the parent to do whatever they want. In fact some could believe that unschooling means we, as in parents, might even have more time to ourselves than before. Actually I am finding this to be the complete opposite. See ,before when we were home”schooling” we had a “school rhythm”. We had transitions into subjects and we had an end to our “school” day. Now we still have a “rhythm” to our days, we just don’t have an ending to our learning. So this means I never know when I might be needed to help aid in a project or to answer a question or two. Unschooling is not about “my” convenience. 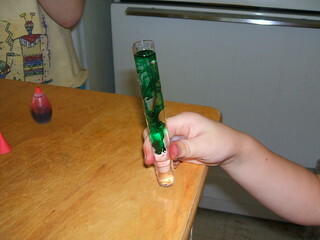 I recently took notice that all the glitter jars have come up missing and found out the reason why is because they make great test tubes :). I took this as a sign to make sure test tubes were added to the supply list. Well while in the middle of organizing our new “playroom”, I was asked if we could do some color experiments. My first response was to say “no, I’m busy” but then I caught myself realizing my daughter was curious about something and since she is still the age of needing assistance with gathering information, it was up to me to help her find the answers (Woo Hoo, I got it!). This is not the only lesson Mama learned though. I also tend to be what you could call a penny pincher (this comes from lots of childhood baggage of not having the best examples of financing and money in general). Papa on the other hand has always been the “money is just another tool ” type. Neither of us “blow” money I just have a harder time letting go then he does :). So when they asked to use the food coloring the word waste came to mind ( I know even as I write this it seems crazy but at least I am being honest and I’m working on it). What a missed opportunity this could have been for “all” of us. I know I still have a long way to go when it comes to deschooling but today I am celebrating this first step on the road to recovery. You know the girls are not the only ones learning on this new journey of ours. “If the reasons behind rules make sense, then there isn’t a reason to make a rule. But people who follow rules aren’t learning how to make decisions. They are only learning to follow someone else’s rules. Had to add this one here too. A quote from Miss Sky referring to Mary and Elizabeth Tudor. I think I am going to start a new topic series here on my blog entitled “Little comments” as a way to not only keep track of my children’s interests but also as a reminder for whenever self-doubt starts to rear its ugly head. So we have officially finished the series X-men Evolution :(. We have tried watching the older cartoon series made from the 90’s but it’s just not the same. Finally, though we found a new series that again has me inserting my foot in mouth at just how much one can learn from watching cartoons.The new series is Marvel The Avengers (which has triggered interest in Thor again from Miss Sky). I never would have given it a second thought but it defiantly (Um, I mean definitely. At least I hope :)) caught her attention. Being that the title of my blog is “Our Journey” I thought this might be a good place to start writing down bits of information I am discovering along the way. It is so funny for me to go back and read past posts, I definitely can tell where I was at the time (and sometimes wonder what the heck I was thinking). Anyway our family has gone through many “radical” changes in the last few months( I am taking the advice of Sandra Dodd and reading a little, watching a little, and waiting a little). I am sure some who have read my blog in the past, deciding to unschool might come as a bit of shock. Well actually it came as a bit of shock to me as well :). Matter a fact it wasn’t until just a few posts ago that I really decided that was what we were going to do. All I knew was our family needed a change. I struggled all last year with both my girls. Little Sis did NOT fall into the typical “Waldorf” mode. Right now at this point in time she is 5 going on 6 (in a few months), school for her was not even suppose to be an option yet. She would have started Kindergarten this year if she was enrolled in traditional school. “Keep her asleep, let her dream, she is too young to start any academics, her mind is not able to comprehend anything yet” this is the message Waldorf education sends out. Well evidently she did NOT get that memo. It took exactly 4 letters in the alphabet and she was reading,not to mention she was already adding everyone’s dice together while playing games(did I mention she learned how to play chess the other day by just watching Papa and Miss Sky, she was even telling her sister where to move). I am so glad I followed my heart. Miss Sky on the other hand did fit into the “Waldorf” mode. She did not want to have anything to do with letters or numbers so telling stories, playing and just being a kid worked for her. It wasn’t until last year when she really started to “rebel” against anything that had to do with school(If it had the word school attached you could bet there would be a fight). I began to see that I was turning her off of learning. It was not until I stopped fighting her that my eyes opened to just how much she was learning all on her own once I backed off the “planned” lessons. So here I am two completely different children yet each one SO very smart in their own way. The funny thing about all of this though is realizing that none of it came from me “teaching “them, they both always have been learning at “their” own pace whether I was involved or not. I always was a fan of unschooling but been scared (and still am) of all the “what ifs” , I just keep reminding myself “read a little, watch a little” and each day “let go” of a little more. The most ironic thing about all this is even though all limits have been lifted off screens we are spending WAY more time together then ever. The reason I was spending SO much time on the computer before was because of all the “school” planning I needed to do. Then after spending all day implementing my “school” plans I needed some “me time” where you would usually find me right back on the computer (Man if I felt the need to do this after our school day I can only imagine how the girls felt). I now not only find myself much more available and open to communicating with my girls but much more connected to who my children really are and who they are becoming. Love and light for the journey !